This article originally appeared on BillHartzer.com and has been republished with permission. Well, uh, yeah, I have. In fact, do you recall that a .TECH domain name won a recent SEO ranking contest? As you might recall, I have mentioned this more than once in the past. New gTLD domain names (keyword rich endings or simply “non .COM” domain names), have just as good a chance to rank than any other domain name. The only exception to this is the ccTLD domain names (Country Code Top Level Domains), such as .FR, .UK, .CA, .ES, etc. Typically those domain names are going to rank well in their respective countries. There’s a better chance that a .FR domain name will rank well if someone is searching from France, for example. I was recently asked by Robert Garcia, after reading an article I wrote about the New gTLDs, on whether or not he should use a New gTLD for a website that he’s working on. He asked if he should go with a .NET or a .SHOP domain name for his new ecommerce website. Since it’s an online store, I personally recommend a .SHOP domain name over a .NET domain name. The visitors, and people seeing the domain name in the search results, will know that it’s a shop. It’s an ecommerce website and not an “informational” website. 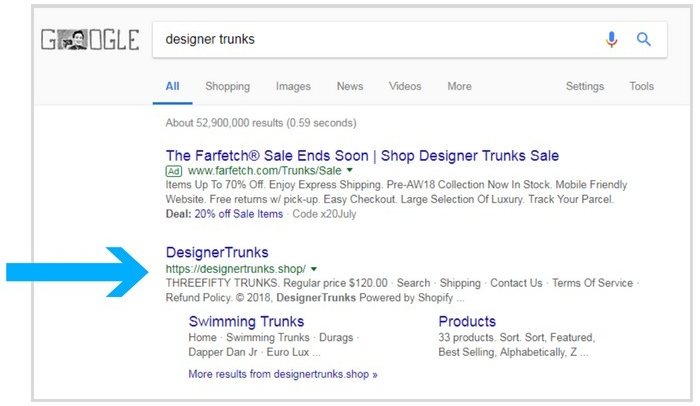 Here’s an example of several different .SHOP domain names that are currently ranking well in Google that Robert shared with me. I haven’t looked at the estimated number of monthly searches for these keywords, so I don’t know if they’re competitive keywords or not. You may want to look up these keywords and decide for yourself. But, nonetheless, this seemly random list of .SHOP websites are ranking well for these keywords. This last one, the designer trunks keyword and designertunks.shop, is an interesting one. Some have said lately that they aren’t seeing EMD domain names rank well. But, in fact, here’s a new gTLD domain name, that’s an EMD (Exact Match Domain), ranking well in Google. The top result.